Modern methods of horse keeping and feeding is the reason why a significant number of performance horses suffer from gut ulceration. 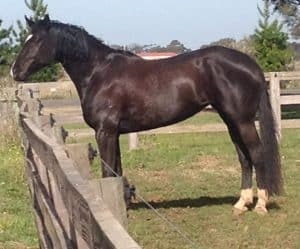 Until recently it was thought to be mainly confined to racehorses but now many equestrian horses are also falling victim to this debilitating condition. It is natural for a horse to graze almost continuously, for more than 50% of a 24 hour period. The horse, whose mechanism survival is flight, does not need to carry a large amount of food in it’s stomach, obviously that would impede it’s speed. So equines have quite a small stomach designed to take continuous, but small amounts of feed. Hydrochloric acid is always present in the stomach, which if devoid of recently chewed food is a cause of gut ulcers. Dr John Kohnke (2008) states “Up to 90% of horses in training, irrespective of breed or stage of training have visual evidence of erosion and ulcerated surfaces on the non-glandular stomach lining”. The digestive tract in most areas is lined with mucous membranes and is only one cell thick and has a vast area for absorption due to its folded structure. No substances are absorbed through the stomach lining, as this begins in the small intestine, therefore the stomach lining must be a tight and healthy barrier. Mucous is produced by the gastric glands in the stomach lining, providing a gelatinous protective coating. Although the horse by it’s dentition is classified as a grazing animal, it’s genetic influence passed down from the days when it was a tapir like creature which browsed on leaves, shoots, herbs, berries, woody stems, flowers & twigs, means they still likes to partake from this wide array of food items. So if one considers that most “performance” horses are locked away from grazing for most of their working life, with only very short spells, it is perfectly obvious why gut ulceration has reached epidemic proportions. I have put the word “performance” in inverted comas, because by doing this, their “performance” will inevitably be severely compromised. Even horses which are regularly spelled, like racehorses, often do not have access to grazing during their spells. Demands of competition and travel also stress horses and trigger gut ulceration. Emotions profoundly influence both the function and structure of gastro-intestinal tissue. It is very difficult to provide good grazing for horses in this day and age, so the next best thing is to feed a lot of hay. Free access to hay should be provided with round bales, if there is nil or very poor grazing. It is a matter of getting a balance right between the rough whites and rich greens for the individual horse, when it comes to feeding roughage – that is hay and chaff. A horse needs at least 1% of bodyweight in roughage (pasture &/or hay) to maintain bodyweight. If it is in poor condition it needs at least 2%. So a horse weighing 450 kg with a condition score of 4 still needs 4.5 kg per day. So you need to know what your horses weigh and what your feeds weigh too. If the horse is lucky enough to have access to good grazing, you need to calculate the forage contribution from grazing when working out roughage feeding amounts. There are formulas available for this, which I use when designing natural diets for clients. Despite vets for many years now, having made it very clear that diets must be based on a high proportion of hay and chaff to prevent gut ulceration, this is often ignored. The lure of pre-mixed feeds & pellets, which are quick and easy to feed is generally popular, and this is the next big problem when it comes to gut ulcers. The vast majority of manufacturers of these feeds recommend feeding a proportionately higher percentage of chaffs and hays with their feeds, but unfortunately their advice is often not followed. I feel sure if adequate roughage was fed in conjunction with these feeds, many problems would be averted. To make matters worse it is also common practice to continually dose horses with gut ulcer products, which use the human model as the basis. So by using a product which stops hydrochloric acid production in the stomach, for example, this interferes with the normal process of digestion. Other products are alkalising, or provide pH buffers or provide a lot of mucilage to coat the mucous membranes of the gut lining. While all this sounds like a good idea, all of them interfere with the normal process of digestion, so the absorption of nutrients are severely disrupted, and they don’t actually heal ulcers. 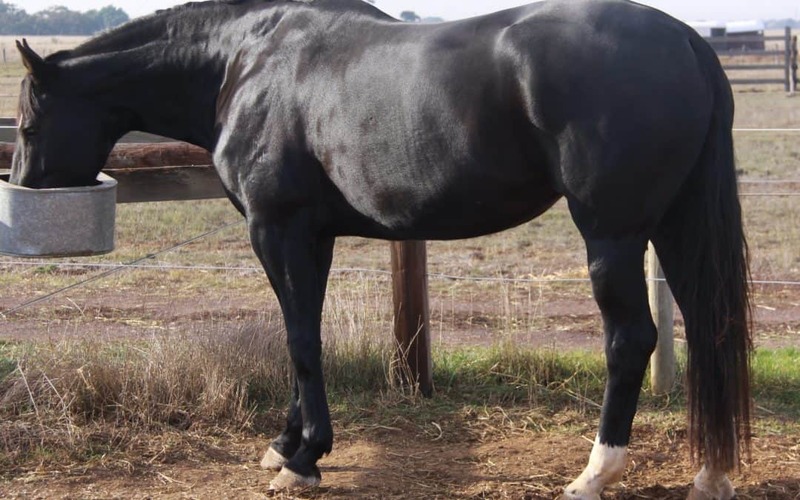 I have been treating ulcers successfully in all types of horses now for more than 20 years and it is essential that the horse in question is fed a natural diet during treatment and for maintenance in the future. If it is treated then put back on a low roughage, high percentage processed feed diet, the ulcers will return. Herbs can be given concurrently with this kind of diet, but it won’t work nearly as well as the combination of natural diet and therapeutic herbal treatment using medicinal liquid extracts. These are necessary for treating horses with ulcers as they are syringed orally and start to be absorbed in the mouth, then go straight to the liver via the portal vein circulation, so they don’t go through the gastro-intestinal tract, where absorption is compromised with gut ulceration. Not all horses with ulcers exhibit the same symptoms, so the symptoms help me in deciding which herbs to prescribe. For example Marshmallow is a nutritious, healing and demulcent herb which is particularly applicable to horses with loose manure. If the horse has very hard or dry manure I would use Liquorice extract instead. Horses with ulcers inevitably have a poor appetite so even when you give them natural feed, they need a helping hand in the form of appetite stimulants such as Peppermint, or Fennel and Fenugreek. The liver also needs detoxification and there are many liver herbs to choose from, Dandelion root being the most gentle and applicable for many horses. St Marys Thistle is called for where a horse has been subjected to a continuing regime of performance enhancing drugs, such as steroids. Agrimony is very good if the horse is prone to scouring. Nervine herbs are also part of treatment, as these horses show a lot of unhappy, nervous behaviour due to the fact that they are in pain, Chamomile and Mugwort are two of the best for gut reactors. For pain relief Meadowsweet heads the list, it is absolutely specific for treatment of gut ulceration. Other herbs to help heal gut ulcers are micro-flora balancers, such as Aloe Vera, I use an extract of the gel of the inner leaf grown organically as part of a prescription. So it’s not just a matter of chucking a few dried herbs in the feed, the herbs must be chosen carefully for the individual horse concerned, dosage is important and the horse must be monitored during the course of treatment so that any necessary changes can be made. However owners and trainers must realise that ulcers return very quickly if prevention is not maintained with correct feeding. There are also three digestive health formulas available through the shop on my website, which can be purchased without a consultation. I am happy to provide advice as to which formula would be most suitable. A VF Consultation could help if you are concerned about your horse. © Victoria Ferguson Dip. Herb. Med.